Our top tips to prepare your car for the warmer weather. Summer is upon us. Maybe you bought a new pair of boardies and refilled the gas on the Barbie in preparation – but what have you done to prepare your car for the hotter climate? Whether you’re driving a second hand car or a brand new sports car, it’s a good idea to do a seasonal once over to make sure your engine and parts are in prime working condition. Here, we provide an easy to follow check-list to prepare your car for the summer heat. ☐ Check your air conditioner system for deterioration. The cooling systems in place in your vehicle can deteriorate when they’re not in use for long periods. The rubber seals and O-rings are especially susceptible to deterioration, and refrigerant fluid is liable to leak. Also check hoses and radiator cap for leaks or deterioration. ☐ Check registration and insurance papers are up to date. Just because it’s a good idea to check these periodically. ☐ Maintain air conditioner coolant. Flush out the old coolant and top up with fresh coolant recommended by your manufacturer. ☐ Top up the battery fluid. Check the water levels and top up with distilled water. While you’re at it, give the terminals a good clean. ☐ Clean windows inside and out. We all know how annoying summer glare can be, so give the windows a good clean with quality glass cleaner, inside and out. ☐ Check all lights are in good working condition. If they’re not, pop down to your local car repair technician to have them replaced. ☐ Inspect fluid levels and top up where necessary. This includes windshield wash, power steering, brake fluid, transmission fluid and oil – and clutch fluid if you’re a manual driver. ☐ Inspect drive belts for deterioration. ☐ Inspect tyres and adjust pressure. During colder months, it’s recommended that you increase the tyre pressure to avoid wear. If you’ve done this, now is the time to reduce the tyre pressure again, and inspect for general wear and tear. Check the manufacturers handbook for recommended tyre pressure. Now that your car is all ready for the sunny season, it’s a great idea to invest in a couple of summer must-haves to keep in your car. Consider investing in a cheap pair of sunglasses to stash in the glove box, and a set of good quality sunshades for blocking the suns rays when parking for long periods (nobody likes returning to a stifling hot car). And don’t worry if some of the items on our check-list appear daunting. If you’re not confident with these tasks your local John Hughes Vehicle Service and Repairs in Perth will be able to help. 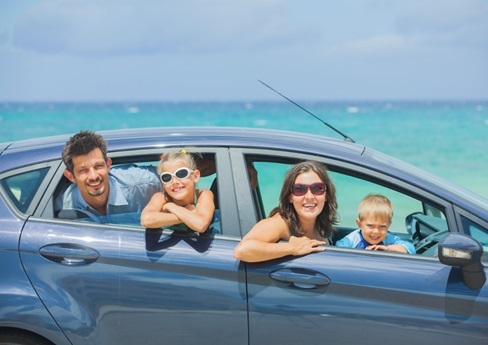 What are your tips for summer drivers?